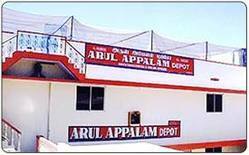 Arul Appalam Depot is a partnership firm, established in the year 1970. The company is engaged in manufacturing, wholesale, trade, exporting and importing a wide variety of Papads, Pappadams and appalams. Products include in these categories, are Garlic Appalams, Black Pepper Appalams, Indian Mixed Masala Pappadums, Red Chilli Pappadums, Black Pepper Pappadums, Chilli Garlic Pappadums, Punjabi Masala Papad. Our complete product range is processed under the strict supervision of our experienced quality controllers, who make sure the supply of quality approved range in the market. For this, we follow the guiding principles of the Total Quality management system by which, we are been able to maintain a consistent flow of qualitative range at our client’s end. "Shri P.K Chandran" is a native of Kerala, holding an experience of 50 years in the domain of Madras Pappadams (Papads, Appalam and Pappadams) industry. 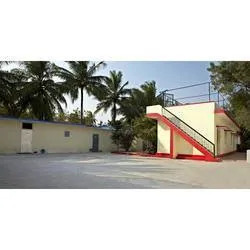 He is the bearer of office in Chennai in Union of Appalam manufacturers as well as has achieved several prestigious and prominent awards in the acknowledgement of his industrial contribution. Our product range of Appalam includes Popadoms, Pappads & Lentil Wafers. The product, Papadum is also known as Papad, Pappad, Papparde, Pappadom, Pappadum, Popadam, Pompadum, Poppadam, Poppadom, Appadum, Appalum, Appala, Appoll, Papari, Pamporo, Puppodum, Pampad, Happala, Popper, Black Pepper Papad & Traditional Papads. An experience that is gained from being in the business for above 50 years, our partner Mr P.C. Sunish has helped us in emerging as an eminent name in the industry. With their rich industrial expertise, our company has been able to serve the diverse and consistent growing demands of clients in most appropriate manner. 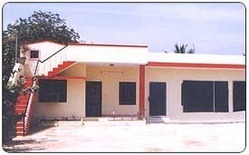 Our company, Arul Appalam Depot is an invention of Shri. P.K Chandran, who have an experience of near about 50 years in marketing and production of Madras Pappadams (Appalam Pappads and Pappadams). He started a business in the year 1970 as a cottage industry, which is located at Kanchipuram after that, he has developed himself as an owner of retail shop name as Arul Appalam Depot at Triplicane, Chennai, in 1985. When the demand for his products is increased, he was forced to enlarge his business into a partnership company. Apart from this, in the year 1995, he also started to deemed and direct export of Appalams and Pappadams across the world by Arul Appalam Depot along with a capacity of producing above 5 lakhs Pappadams per day. We possess a state-of-the-art infrastructure, spread across a huge landmass and are equipped with modern and required amenities. 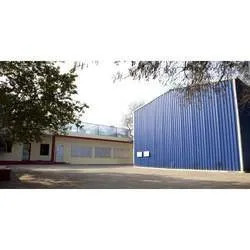 Partitioned into various other departments such as quality control, production, research and development, warehouse, administrative and others, our company is capable of executing systematic business activities. Latest machinery is installed in our production department, by using which; we produce a comprehensive range within the prescribed time. Manufacturing, Trading, Importer & Exporter of Appalams & Pappadams. Possessing a team of qualified and experienced professionals we are capable of meeting the diverse and exact requirements of our esteemed clientèle. Our experts are well-versed with the latest production techniques, equipment and tools, which make us able to stay in pace with the existing market developments as well as specification of the clients. Our team carry out production process under the utmost hygienic condition and ensure clients that they are in conformation with the set norms and guidelines of industry. We are an ISO Certified Company. 75 % Of the ranges we process are exported in the International market, mainly in the United Kingdom. Moreover, before final shipment of our range, we ensure clients that the products, we offer to them are subjected to 100% quality tested. Our company obtains a report of the laboratory from the appointed agent through our foreign clientèle before making delivery of the consignment. Besides, we also carried out a yearly quality audit by a representative of the foreign clients. The buyer also makes his own personnel inception of the factory one time in a year before his contract has been renewed for the assuring year. Our organization has constructed a sophisticated and sound infrastructure, outfitted with all the necessary and required amenities. Furthermore, our infrastructure consists of various other departments, which helps us in executing systematic business operations. To look after these departments, we possess a team of specialized professionals. They utilize the available resources efficiently as well as make certain to execute smooth and swifter business activities. Rich industrial expertise, prompt delivery of bulk consignment and client centric approach are some factors that help us in attaining a desired position in the industry. By maintaining transparency and fairness in our dealings, our company has been able to acquire a large base of client from all across the world.